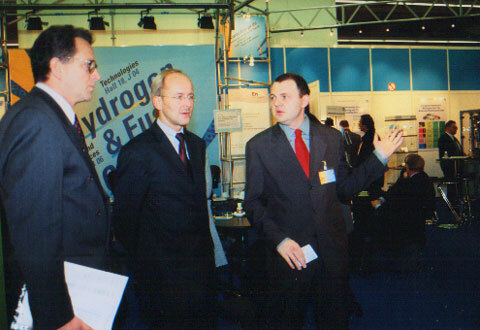 We thank you for your interest in the Joint Exhibition in Hydrogen and Fuel Cells at the HANNOVER FAIR 2000 (20 � 25 March 2000) At the biggest industrial fair of the world, 32 international exhibitors showed their state of the art in technology (Hall 18) and products and services (Hall 8). 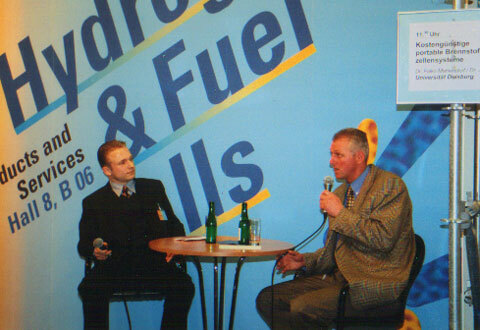 An additional and much-considered presentation permitted the central forum, integrated into the exhibitor aera. 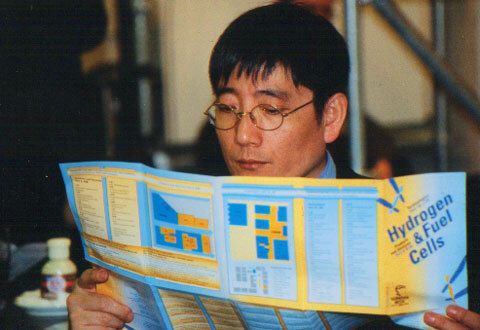 The international Forum-Program was very attractive for the trade fair visitors at the joint exhibition. Here new concepts in the development and commercialization of Hydrogen and Fuel Cells were presented and discussed with other exhibitors and specialized visitors. The joint exhibition was visited by a number of high-ranking international VIPs from politics and industry who had a chance to gain a good overall view about the mutual topic. The international conference Energy Summit on 22 and 23 March at the Exhibition Convention Centre draw much attention by the participants. Amory B. Lovins from Rocky Mountains Institute explained his view of the strategy for the Hydrogen Transitron. 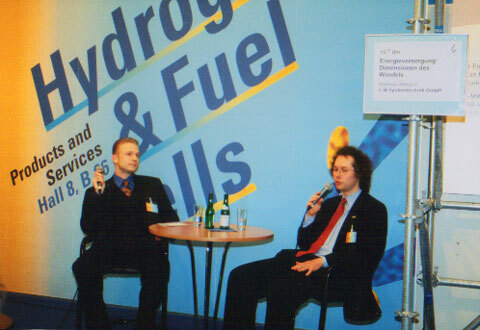 In Part III international experts discussed their opinions under the topic: "On the way to a Hydrogen Economy � full steam ahead!". 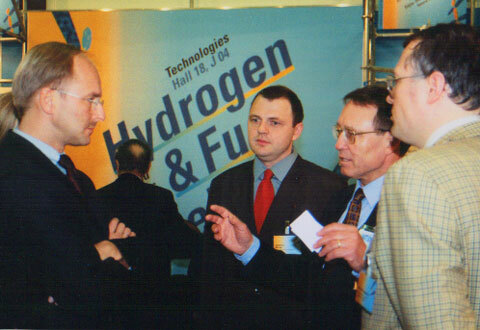 The next HANNOVER FAIR 2001 will be 23-28 April, you are most welcome to join the international community of Hydrogen and Fuel Cells experts next year, be it as exhibitor, visitor and/or VIP. If you have any questions, remarks or new ideas to the Joint Exibition, please let us know. Remarks for our Internet visitors: At our http:/www.hydrogenambassadors.com we count hits from 36 countries (from USA and Canada to Australia and Singapore). Every day there are over 5.000 hits, with more than 13,000 kBytes Data loaded down. 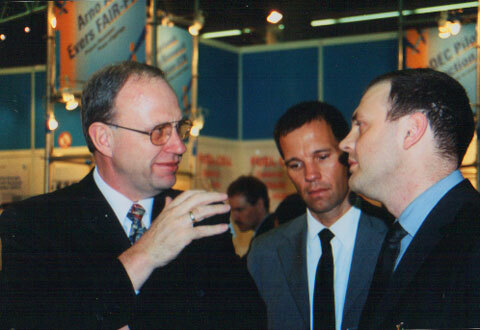 We are very proud of this result and hope to serve you with this extensive internet documentation about the HANNOVER FAIR 2000. VIP Visit of Wolfgang Branoner, (left) Minister for Economy and Technology, Senator State of Berlin together with Tobias Renz (middle), Arno A. Evers FAIR-PR, Dr. Rolf Ewald, President of the German Hydrogen Association and Dr. Ulrich Schmidtchen, German Hydrogen Association. 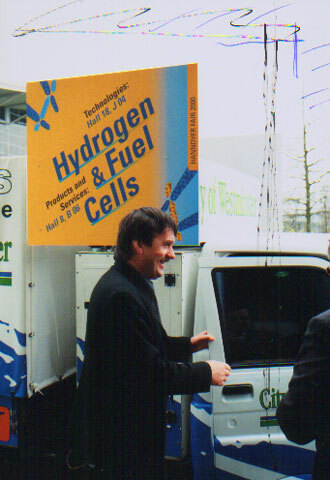 Wolfgang Jüttner, leaving the hydrogen driven car from ZeTek Power after his successful drive over the Hannover fair ground.